Serial port COM cable for Inspeed Vortex Series wind sensors. This cable will connect your Inspeed Vortex Series wind sensor to a computer with a COM port (serial, 9-pin) for use with Windware software (only). It is also compatible with WeatherDisplay software. If you do not have a COM port (like most modern laptops) please also add a COM-USB adapter. See www.inspeed.com for more information. Note that Inspeed wind sensors are not serial devices; this is only for use with Windware software. 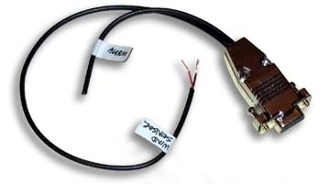 Note - select the Jack Connection for use with Flex Wire Anemometers or Mag Mount Anemometers.